Heather: May has always been my favourite month here in the Comox Valley. With the leaves on the trees at their most glowing green, and the sun higher in the sky, and plants at your knee or over your head, how can you not feel embraced by nature’s glory? Like the first rays of morning shining through the trees, the childrens’ individual strengths and new growth really shone through. 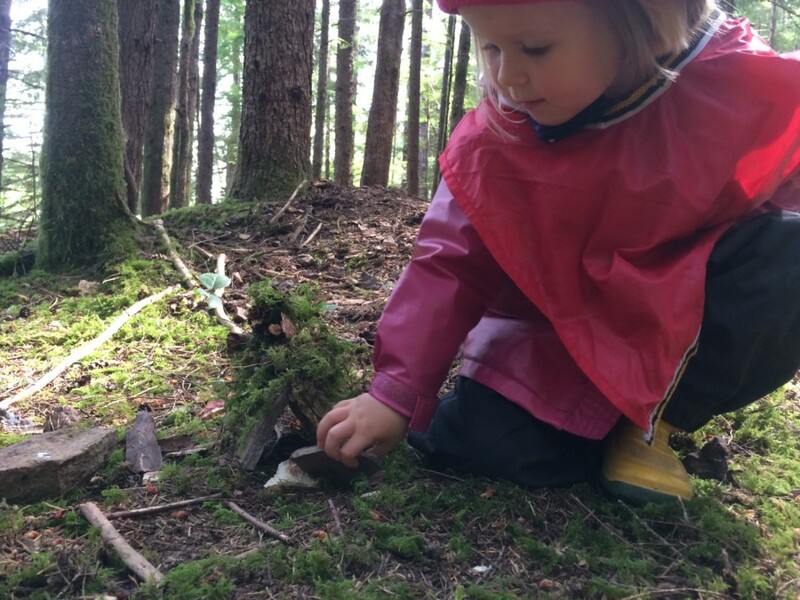 This month was full of opportunities to expand outward into the community and to deepen our connection with nature. Through stewardship activities like trail building and saving the fish trapped in a shrinking pond we showed our appreciation and passion for protecting the forest that teaches us so much; and gives us a place to play. 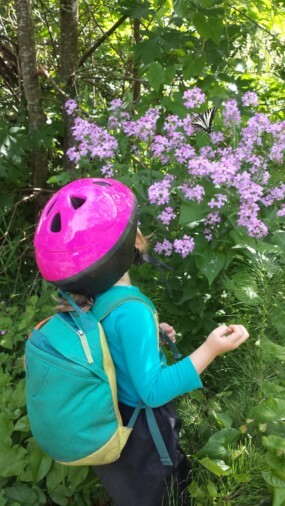 The children’s general awareness of specific species and senstivity of organisms seemed to develop this month as they are consistently calling out the names of plants and animals they know. 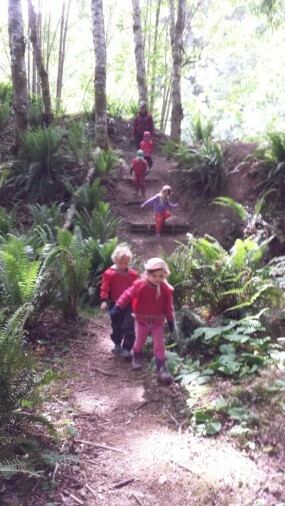 They are learning to tread lightly around snails and fragile ferns. 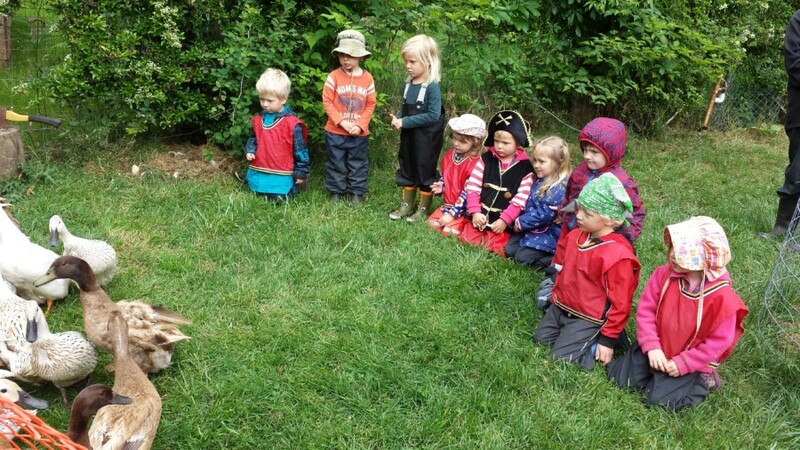 With each other they offer to help and play more than ever – each child respecting the differences and individual skills the others bring to the group. They’ve come so far. I’m very proud of them. These children are aware of the people and forest around them, and they showed it this month through the enthusiasm they had for protecting and enhancing the forest. With help from Kevin from the Village of Cumberland, we build up a trail to avoid seasonal puddles that widen the path. Gathering rocks and lifting heavy loads is tough work, and these Seeds tackled the task of fixing the trail with vigour and pride! 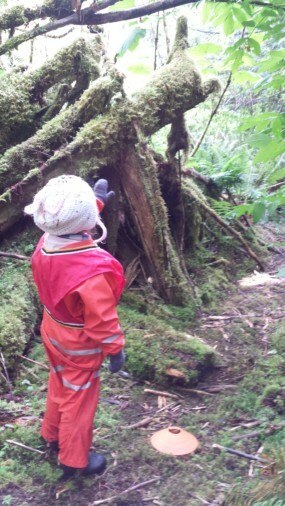 ‘Heavy’ work helps children self regulate as it engages a body’s sense sense of spatial surroundings. Essentially, grounding a kid in their bodies and the space around them. 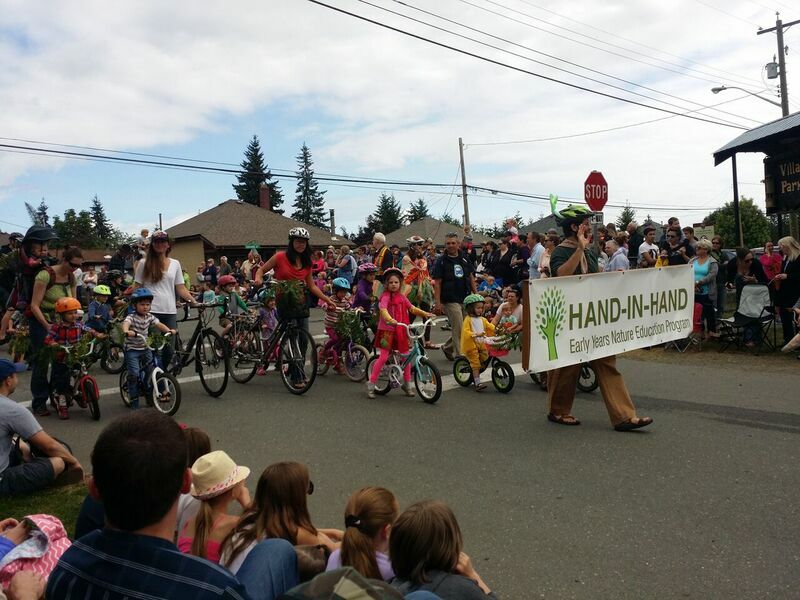 Helping the community in which we play and doing good for our bodies at the same time! 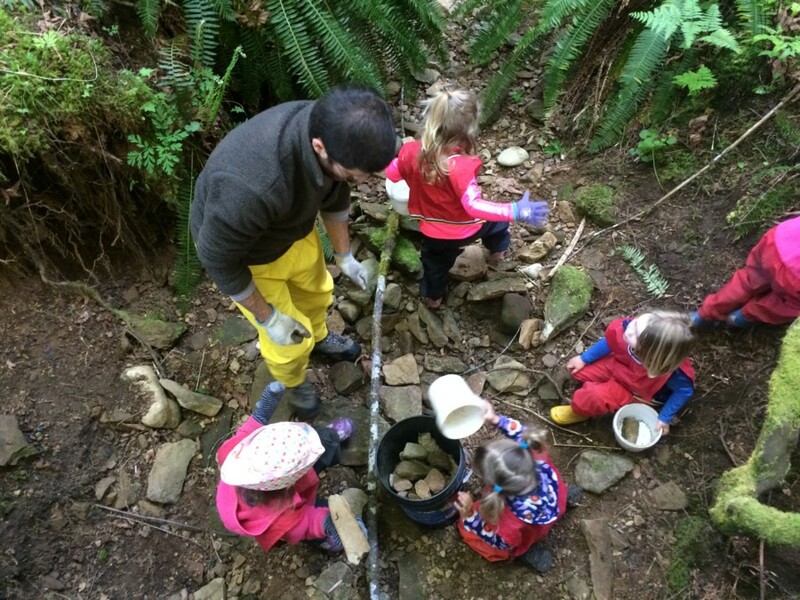 At the waterfall classroom this month we experienced the growth of many plants in the understory. Perched on top of the “mouse house”, pictured here, was a huckleberry bush. 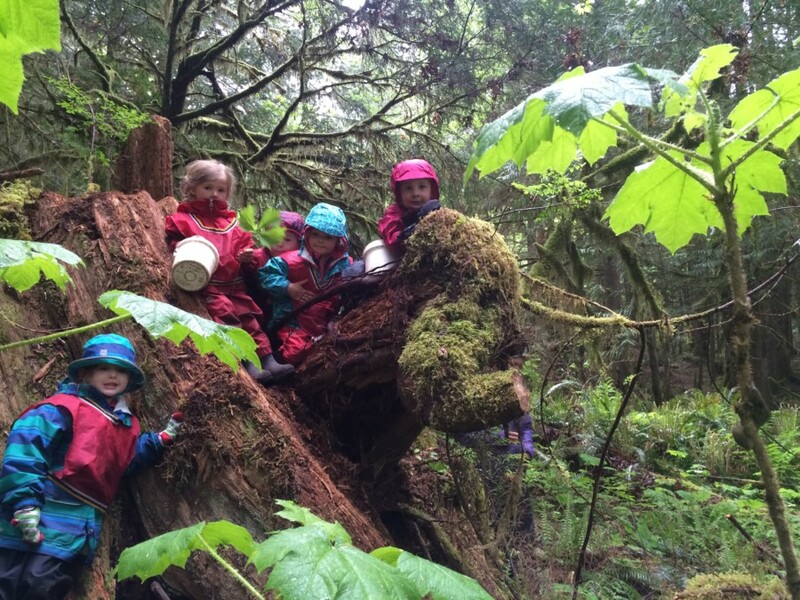 Despite the children’s love of breaking down the soft fibres of the stump they mostly avoided the roots of the huckleberry so it could continue to cling on! 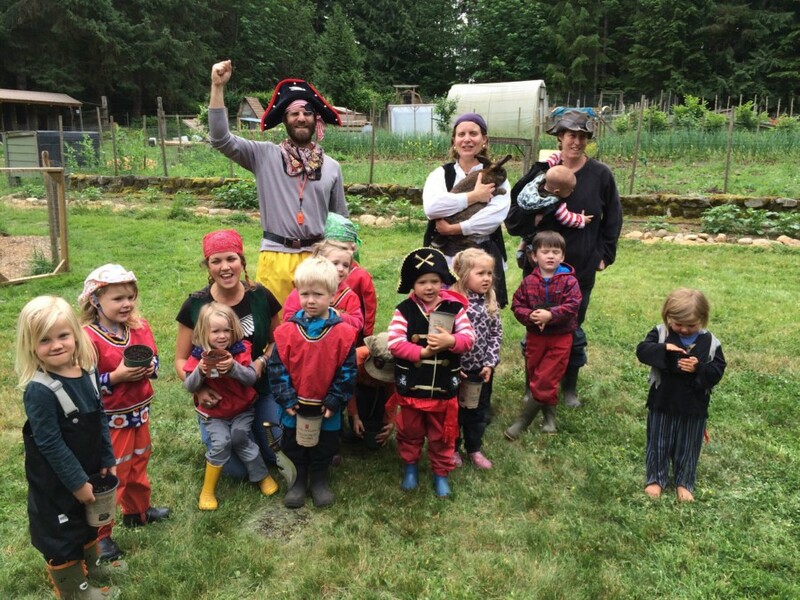 At the Pirate’s Pond we learned a little about where our vegetables, eggs or meat might come from by forging a connection between the farmers and our food. And a fun time playing too! 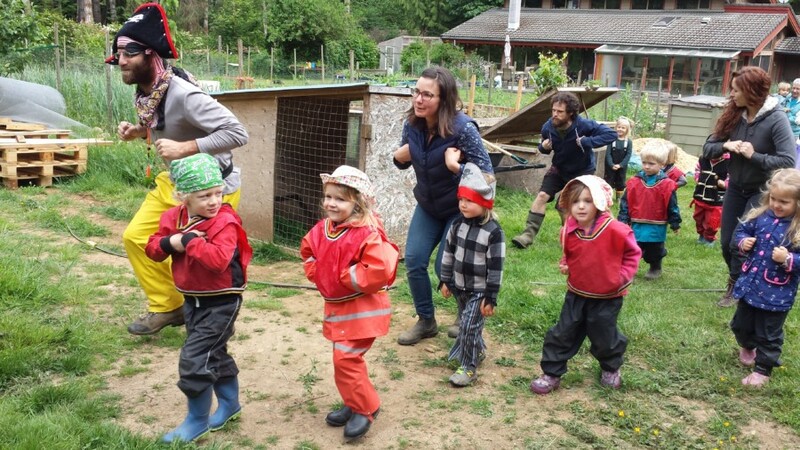 Of course, to see the chickens, chicks and roosters we had to walk like chickens too…we’re good! 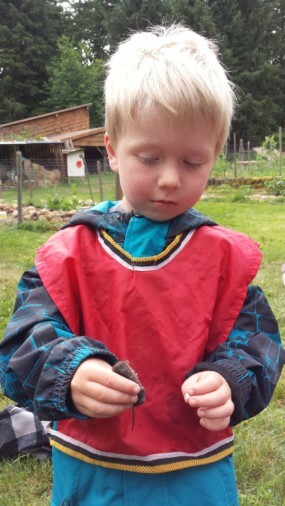 Beyond the pigs, chickens, ducks, cats and rabbits, Fin gently picked up this vole for us to check out. 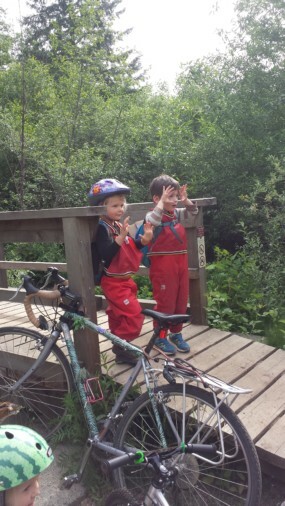 Torin and Poppy have different hand signals to their friends to ‘STOP’ at the bridge for a salmon berry snack! 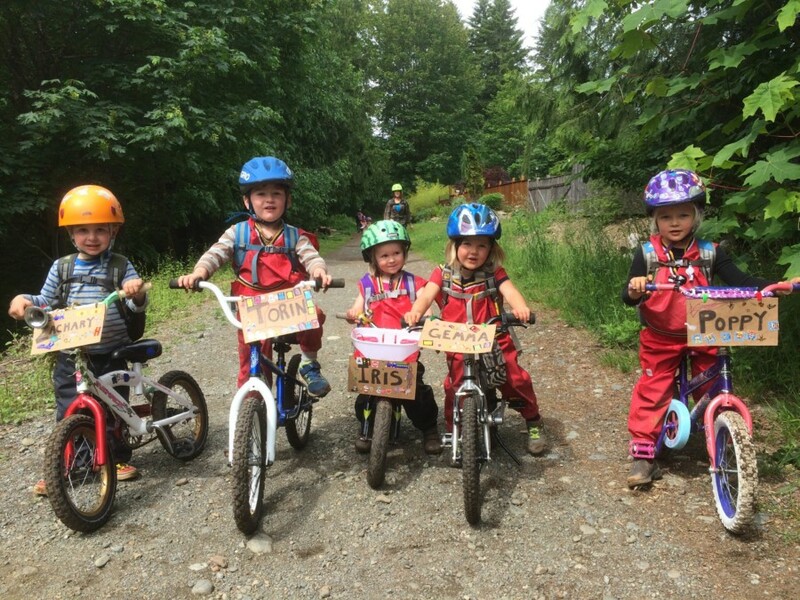 We hit the gravel paths of Cumberland on our bicycles for a field trip behind the village. In this way we gain a better understanding of distances and the surrounding community we live in, beyond our ‘classrooms’. PArticipating in the May Long Weekend in Cumberland parade we had a chance to have a face in the community and support the theme: A Salute to Cycling. We all got together and unified behind the banner and with bits of nature attached to us. We won for the most bikes and decorations for our age group!! This month they’ve also shown increased interest and retention in identifying specific plants and animals. Regularly, it is something we can eat, is dangerous or has some significance to the kids. Nova finds some Devil’s Club which is towering over her head. She and the seeds can easily recognize it now and know to avoid it and put a cone by it to warn others. Finding this poppy plant in the middle of the large field, and it’s adjacent Iris plant, was a miraculous find. They children were essentially incredulous that such a big beautiful flower could be real! 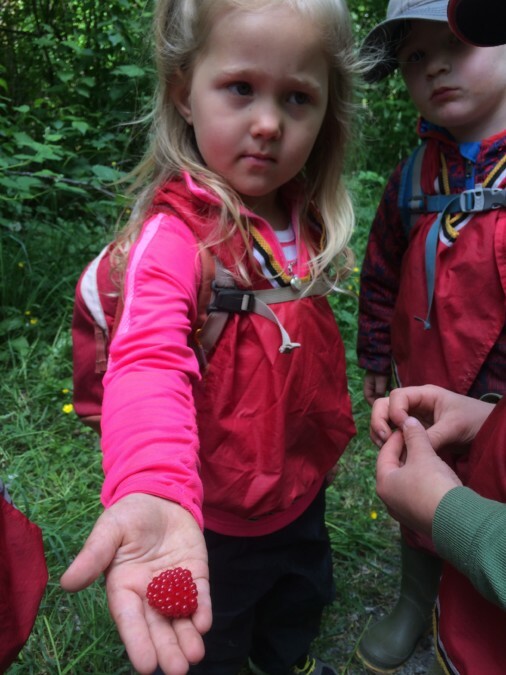 Identifying and munching on Salmon Berries has been a delightful treat this month! There have been constant reminders of how far these kids have come in the way they play this month. Here are some examples of the ways they challenge themselves and try new activities that push what they know. After hearing and seeing people playing disc golf, we decided to follow the route and check out new areas of the forest. These stairs built into a hill were tall, but they tackled them for the sake of going further than ever before! Iris spent a solid amount of time decorating and adding to this house made of flat pieces of rock She added many details, from windows to a chimney and doors. A beautiful fairy house! 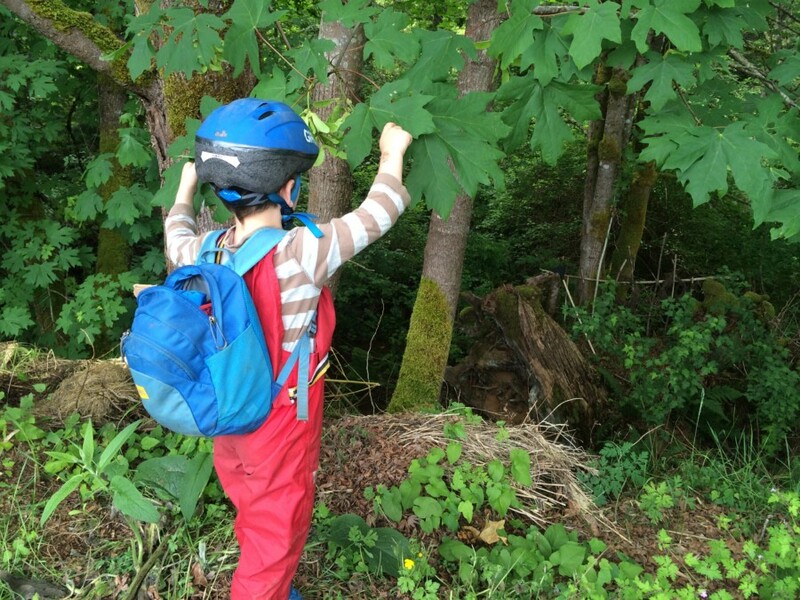 Torin discovered a ‘witch’s house’ on our bike ride. The challenge of getting down to it and exploring in a totally new area was rewarding physically and creatively as the new spot incited new thinking about how we could play there. At the end of our biking field trip we went into the mini bike park. Many kids choose to ride around the circular route while others ran around it. 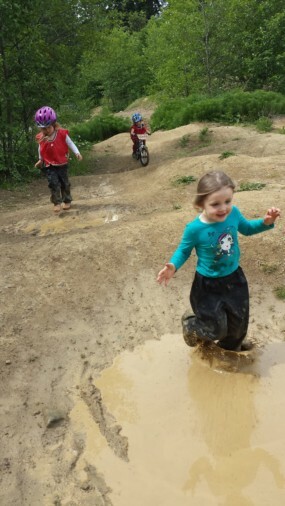 Amelia and Kaya laughed and ran through puddles – getting so wet and muddy! They seemed proud of how dirty and splashy they were.